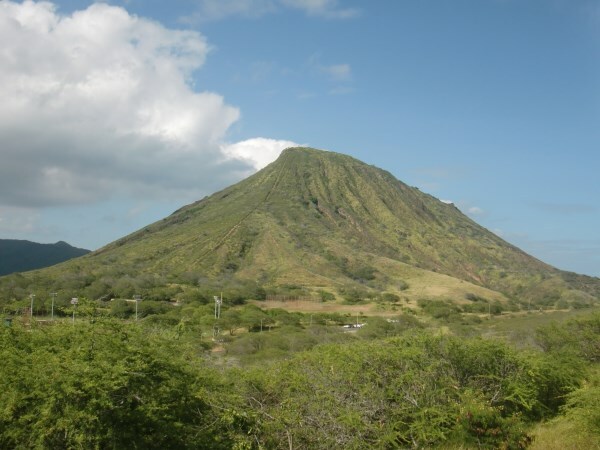 Hawaii can usually be found at the top of many travel bucket lists...and for good reason! Ever since my short visit 9 years ago I knew I wanted to come back one day with my family and explore. Without a doubt the weather here on Oahu is the best I have ever been in. For me the key really is that you have such comfortable weather and can still be sunning yourself on a beautiful beach. Costa Rica had some wonderful climates but I can assure you none of those were anywhere near a beach. 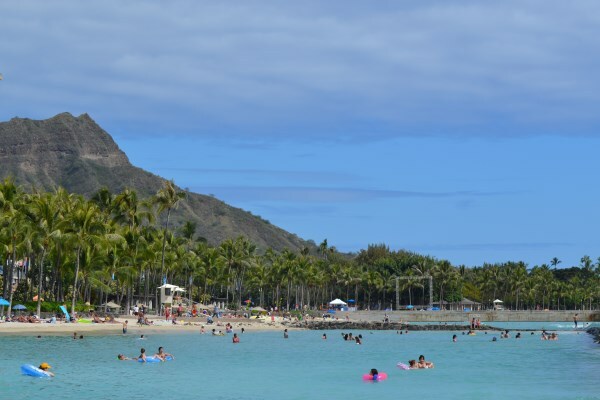 Excessive heat is typically what you find on the beach in or near the tropics but here on Oahu there is almost always a nice breeze (trade winds) and the temps stay between 68 and 85 throughout the day and night. I mean really, does it get better than that? What can I say? The beaches here are everything you imagine they would be. Clean, stunningly beautiful, and so diverse. You can have rocky with tide pools to explore, huge waves to surf, or peaceful lagoon like water perfect for relaxation. Most beaches have facilities like bathrooms and showers which is so nice to take advantage of before heading home. Another part I love is the downright perfect temperature of the water. Not too cold yet refreshing enough to feel nice after sitting in the sun. You really cannot do much better than the beaches here! I have seriously not seen a single mosquito..not one! I am usually the person who sits itching while everyone else in the area wonders how I could be getting bit as they aren't getting touched. This has been magnificent. We have seen an enormous centipede and there are a few creepy crawlies around sometimes but nothing terrible and nothing biting me. In over a month I have not gotten a single bite! In the interest of full disclosure though there are many sea critters that I would rather not see. Urchins are any place you see rocks or coral and can give a nasty sting. Also after every full moon there are 3 days that the South side of the island, in particular, is inundated with jellyfish. They are not my favorite critter! After living in Costa Rica, where some of the finest and sweetest pineapples grow, we have become pineapple snobs. In Asia, the pineapples just did not make the grade, they were small and lacked the flavor that we have gotten used to. Since arriving in Hawaii we seem to be back in the land of delicious fruits, pineapple being one of the yummiest and our #1 go to fruit. They are more expensive here than in Costa Rica but I can forgive them of that as I am just so grateful to have a source for my favorite fruit again. Again, not much I can say here except that the views are endless and stunning. 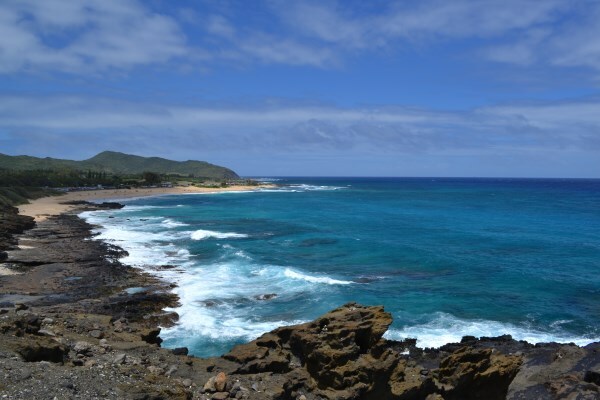 Whether you are looking out at the ocean and its ever changing landscape of blue, or turned around facing the stunning fluted mountains that make Hawaii a perfect spot for filming so many great movies, you will not be disappointed with what you see. I simply need to have natural beauty around me and Hawaii has it in spades! Another thing that we seem to need around us is unique wildlife. We love zoos and aquariums but usually leave feeling sad for the animals and wishing we could have a more authentic experience. Since leaving the US we have discovered the amazing feeling of seeing animals in the wild. We have seen countless varieties of monkeys, sloths, elephants, dolphins, kangaroos, and more. 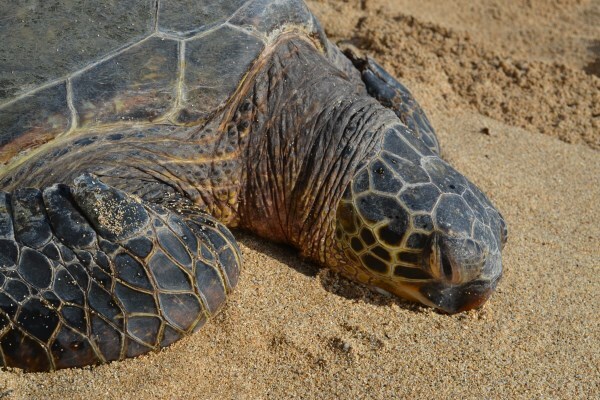 Since landing in Hawaii some of the biggest thrills have come from spotting spinner dolphins, humpback whales and most often large sea turtles. There may not be very many land critters here but the sea life more than makes up for it. My oldest son, Dylan, fell in love with surfing while we lived in Costa Rica. We drove down to the beach as often as we could in order for him to improve. Then we moved to Asia and not a single place we have been was good for surfing. We spent a small amount of time in Australia but it was winter and too cold to surf. Within a week of arriving here Dylan bought his own board and has been surfing as much as he can. 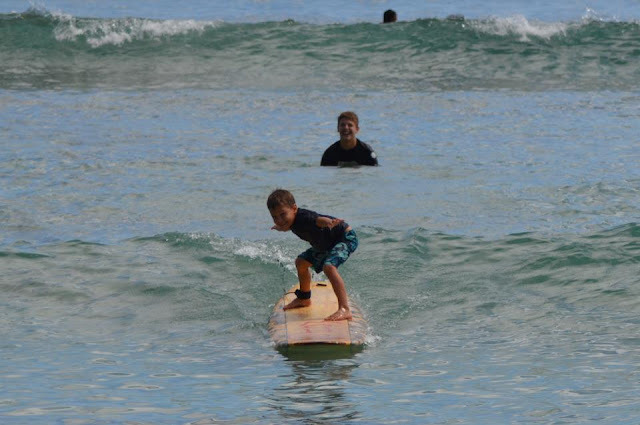 We even got the 5 year old up and surfing. Looks like we have 2 fans in the family now. The great thing here is that there are beaches and waves good for every level. When we were staying in Waikiki we frequented a shave ice place and fell in love. It was the prefect treat after a few hours at the beach; cool, refreshing, and sugary sweet. Everyone seems to market it and many stores sell it in the area. When we moved closer to the North Shore the love deepened. The ice is smoother and the serving is large enough for 4 of us to share. We have had slushies around the world but this Hawaiian shave ice is a whole other thing. For the best around try Matsumotos in Haleiwa, North Shore! Ever since we really started using the Internet on a regular basis it has been hit and miss as to quality and speed. When we moved to Costa Rica we literally had dial up Internet and it would take over a day to download a short TV show. The Internet improved with time there but then we moved to Asia. We had plenty of areas with great speeds but most of the time we were at the mercy of the hotel or guesthouse and often times the speed was in and out. Our week in Australia saw virtually NO Internet at all as hotels do not offer it and 3G is expensive and rarely works outside a major city. Since landing in Hawaii we have marveled at the speed of the Internet. Very few dropages and we can typically download an episode of our favorite shows in less than 5 minutes. I know it is more US thing rather than just being Hawaii but we are loving it! To most people basic plumbing is no luxury or even something to notice at all, but to us the functionality of plumbing more than anything else is what amazes us! In the past 7 years there have been very few moments when plumbing worked like it does in the US. In Costa Rica and many countries in Asia you cannot even flush toilet paper as the pipes and septic system (or lack there of) can not handle the strain. There were regular problems with one of the pipes, leaking toilets, downright broken toilets or showers, and a complete lack of hot water for even the shower in some cases. In Asia the stakes were raised again as we were now faced with a complete lack of toilet paper all together and the introduction of the lovely squat toilet. In Asia, most people feel that a wet room means a clean room so trying to keep clothes dry was a daily challenge. Even in our own apartment the house keeper would come in and literally hose down the entire bathroom, walls and all. And have you heard of suicide showers?? Google it and then tell me US plumbing is not amazing! Admittedly, some of these are simply strong appreciation of the little things after living in 3rd world or developing countries for the past 7 years. The great thing about Hawaii is that it feels exotic and foreign yet still retains the functionality and convenience of the US. Hawaii is truly a beautiful and fun spot to be but it is not perfect. Things are expensive here! Gas costs more, groceries are all imported so that costs more, and although we scored a great sublet, apartments are expensive as well. I won't even discuss health insurance...another article no doubt! How about you? Have you been to Hawaii? What was your favorite island? Wat was your favorite thing about it? Haha Australia internet. Yup. Nonexistent and slow. Love USA internet! Agreed, so surprising about Australia internet since it is a fully developed country. I had just assumed it would be like the US! Oh how I love Hawaii! 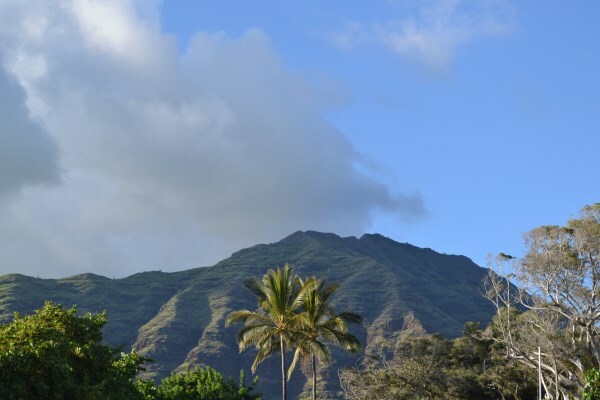 While there is loads to do on Oahu and Maui is absolutely gorgeous, I love "The Big Island" Hawaii the best. There is so much diversity in one little place. You have the Volcanic parks, the lush green tropical side of the island as well as mountains, farms and some of the best scuba diving! Have fun! Sounds like you had a great time in Hawaii! We've been to Hawaii several times and we just love it! We spent our honeymoon on Oahu and the Big Island, and after that, we went to Maui. Maui turned out to be our favourite, so that's the island we keep going back to. I also love the fact that I can hike in the jungle without having to be on the lookout for venomous snakes and spiders, and no need to worry about being eaten by any larger mammals hehe I find this an especially good thing now that we have kids! And as for the shave ice, it's sooooo delicious. I put off trying it for the longest time since I thought it couldn't possibly be all that much different from the slurpies that I enjoy here at home - but now that I've tasted shave ice, I'm hooked on it! If you ever go to Maui, try the shave ice at Local Boyz or Ululani's - they are fantastic! Yes we realy are enjoying. WE are lucky as we will be here for at least 4 more months then thinking of movng to another island. SE Asia will just be totally different. Be prepared for beauty but a very different standard of functionality with basically everything. I LOVE Thailand, especially in the North, enjoy! No way to compare them really, they are just so different! We plan to although I think we have to choose just 1 other to go to. The cost of inter island flights is so high, especially x5! We are thinking the Bog Island as there is so much to do and learn from! That's lovely, I have once visited Hawaii with my family for a vacation and I love to stay permanently over there. I really love the beauty of nature. Head over and do it! It really is a great spot! I have not been to Hawaii in over 20 years. I used to go fairly regularly with the Navy, but only to Oahu. I highly recommend the U.S.S. Arizona Memorial at Pearl Harbor. My wife has no desire to go to Hawaii, but our boys do, so maybe we can convince her. Take care. Wow, I can't imagine anyone NOT having an interest in coming here:) WE were just talking about Pearl Harbor and wanting to go. I wish it were less expensive though. We'll go at some point,I was bummed I didn't go last time I was here. thanks for describing the 10 reasons because its very useful for tourists. pictures looking interesting to visit and no doubt that Hawaii is a must visited tourist destination. To get about the India travel and India must visit destinations then please visit. Yes, And it is a destination which most of the foreigners and locals are asking from us to drive. We have visited Hawaii twice and might be on Oahu from January through March in 2014 if my husband does a sabbatical at the University of Hawaii Cancer Center. There is great flora, fauna and geological diversity on the Big Island due in large part to micro climates. If you want more dry days, stay on the western side of the island (the Kona side). Seems like you had a great time in Hawaii. I have not been to Hawaii in more than 20 years. I used to go quite regularly with the Navy, but only on Oahu. I strongly recommend the USS Arizona Memorial at Pearl Harbor. My wife has no desire to go to Hawaii, but our children, so maybe we can convince her. Wouldn't disagree with the beaches love them where ever I find them and there is one thing that I do when I find one :) you guessed it yeah!!! get in it and have a wonderful sea bath. We love them too! Especially playing in the waves! Great tips! I also love the lac of snakes, makes hiking so much more enjoyable!